The fava beans have been ripening over the past two weeks and I’ve been processing many pints for the freezer but I’ve also been mixing them with other vegetables of this early summer season, sugar snap peas, beets, cauliflower and mint. Three new recipes have been hits and make me glad that there are lots of favas in the freezer. Yes, fava beans take a while to prepare—shelling, blanching, pinching the skin off each bean—but these recipes are so quick they make up for the time spent preparing fabulous favas. 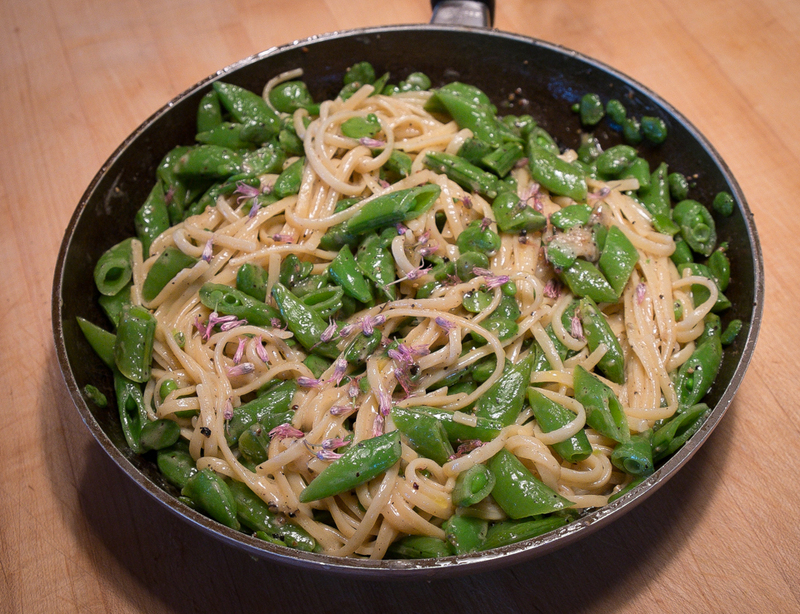 The first is a pasta recipe from Melissa Clark and her Good Appetite column in the New York Times: Cacio e Pepe with Peas and Favas. Clark adds shelled peas and shelled fava beans to the classic Italian preparation of cheese and black pepper on spaghetti. Watch the video that’s part of her column to see how quick and easy this recipe is. Coarsely ground black pepper toasts briefly in melted butter, a little of the pasta water added to this mixture turns it into a sauce, the cooked pasta and grated cheeses tossed into this sauce result in perfectly coated strands of spaghetti ready for the addition of peas and favas. Instead of English peas I used sliced sugar snap peas because that’s what’s growing in my kitchen garden. 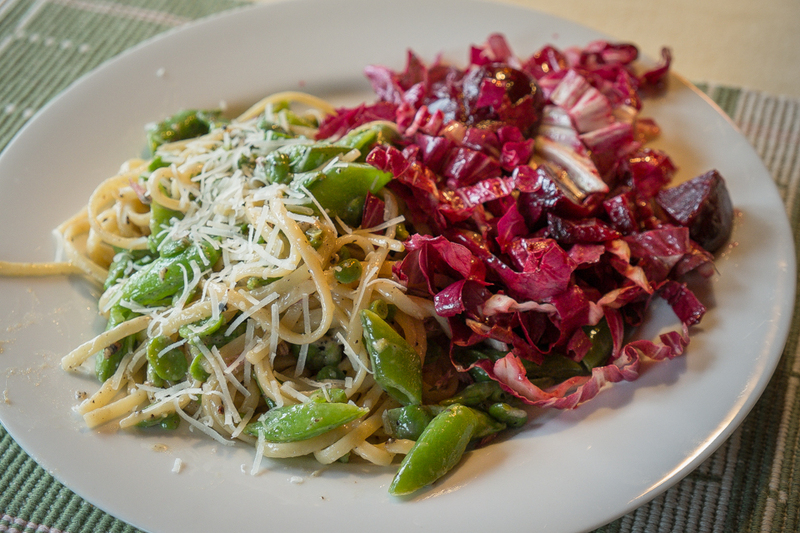 I served this dish with a salad of radicchio and beets, great flavors to go with the pasta. 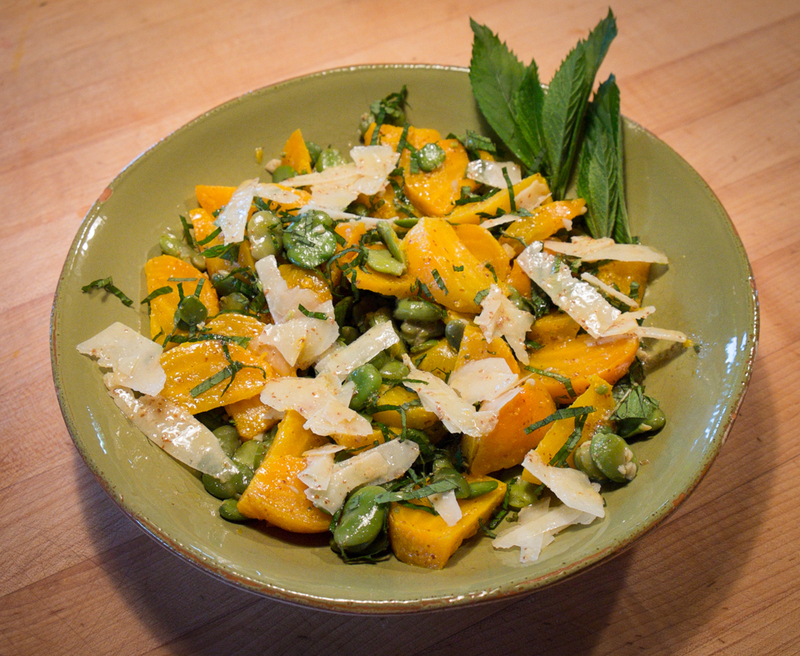 The second is a salad, Golden Beets, Fava Beans and Mint, from Deborah Madison’s newest cookbook, Vegetable Literacy (2013). Sweet golden beets and earthy bright green fava beans meld with slivered mint and thinly sliced salty cheese in lemon vinaigrette. A feast for the eye and the tongue! Madison recommends Ricotta Salata cheese but I used Pecorino Romano, another dry, salty cheese, because that’s what I had. Feta or goat cheese would be tasty too. Madison writes that she “adores fava beans prepared this way.” I do too. Steam the beets until tender. Rinse briefly to cool, then slip off skins and slice the beets into wedges. Toss them with a little vinaigrette. Shuck the fava beans. Drop them into boiling water for about a minute, then drain and drop them into a pan of cold water to cool. Pinch off the skins and moisten the beans with a little of the vinaigrette. Toss the beets with the favas and mint leaves. Taste for salt, and, if dry, add a little more vinaigrette. Heap them onto a platter. Put the cheese in the bowl and toss it with the remaining vinaigrette and season with pepper and salt, tuck into the vegetables and serve. The third is a variation on Nigel Slater’s Asparagus, Fava Bean and Mint Pilaf from his cookbook Tender: A Cook and His Vegetable Patch (2009). I love this pilaf and love experimenting with it by adding other vegetables. Basmati rice cooks in a skillet slicked with melted butter flavored with green cardamom pods, black peppercorns, a cinnamon stick, whole cloves and cumin seeds. The vegetables go in just before the rice is done. 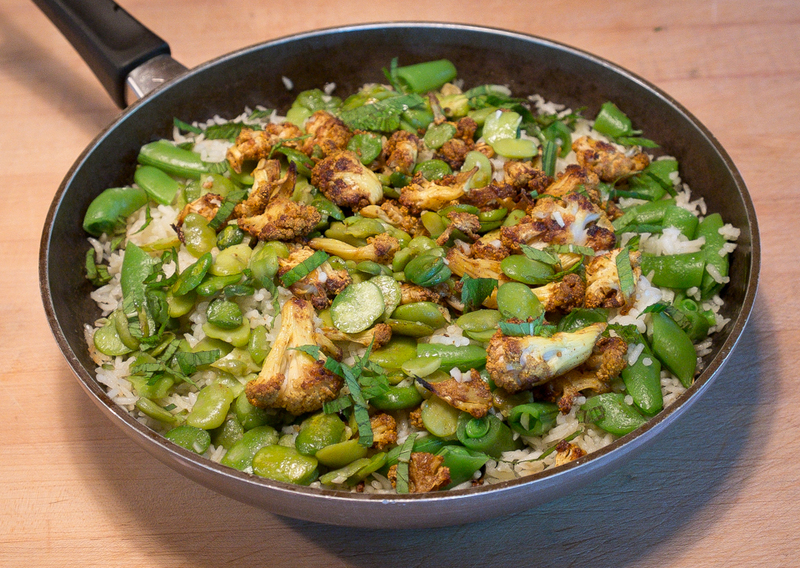 This time I added cauliflower I’d roasted in oil and curry powder and sliced sugar snap peas along with the favas and served yogurt mint sauce and pear chutney on the side. There were no leftovers. Wash the rice three times in cold water, moving the grains around with your fingers. Cover with warm water, add a teaspoon of salt, and set aside for a good hour. Cook the fava beans in deep, lightly salted boiling water for four minutes, until almost tender, then drain and slip off skins. Trim the asparagus and cut it into short lengths. Boil or steam for three minutes, then drain. Melt the butter in a saucepan, then add the bay leaves, cardamom pods, peppercorns, cinnamon stick, cloves, cumin seeds, and sprigs of thyme. Stir them in the butter for a minute or two, until the fragrance wafts up. Drain the rice and add it to the warmed spices. Cover with about 1/4 inch (1cm) of water and bring to a boil. Season with salt, cover, and decrease the heat to simmer. Finely slice the green onions. Chop the parsley. After five minutes, remove the lid and gently fold in the asparagus, fava beans, green onions, and parsley. Replace the lid and continue cooking for five or six minutes, until the rice is tender but has some bite to it. All the water should have been absorbed. Leave, with the lid on but the heat off for two or three minutes. Remove the lid, add a tablespoon of butter if you wish, check the seasoning, and fluff gently with a fork. Serve with the yogurt sauce below. Stir 2 tablespoons of chopped mint, a little salt, and 2 tablespoons of olive oil into 3/4 cup (200g) thick, but not strained, yogurt. You could add a small clove of crushed garlic too. Spoon over the pilaf at the table. Some vegetables are mysteriously expensive and others are just mysterious. Fava beans fall into the mysterious category. More than any other plant in my garden they draw the “what’s that?” reaction from visitors as they point to the rangy, floppy-leafed plants with the shiny, spear-like pods protruding from the stems. My answer usually involves pulling off a pod and opening it to reveal large, light green beans nestled in a row against the spongy white interior of the pod. If people want to taste one, I’ll pop out a bean and peel off the light green outer skin, revealing the bright, darker green bean inside. A raw fava bean has a sharp taste with an earthy, nutty undertone, completely new for many people. They are tasty raw with olive oil and salty cheese. “Cooked,” I add, “the sharp taste mellows but the earthy, nutty flavor remains.” At this point, I either make a convert to fava beans or we move on to something a little more familiar tasting. While their mysterious appearance is a fun reason to grow fava beans, it’s their taste and the fact that they are my husband Scott’s favorite bean that keep me growing them each year. But getting to that taste once you’ve harvested the pods does involve those two steps of shelling the bean from the pod and then removing the skin from the bean. For some, even the great taste isn’t worth the fuss, but for the rest of us fava lovers it’s more then worth the time spent. As they begin to ripen, I’ll pick a two or three pounds of pods to prepare for dinner, selecting the pods that are fullest because they contain the most mature, most flavorful beans. Before starting to shell them, I’ll put a pot of water on to boil. By the time I’ve finished shelling the bean from the pods, the water is boiling and I blanch the beans for one minute, just long enough to loosen the outer skin. I drain the beans, chill them briefly in ice water, drain them again and finally slip the beans from the skins. The photo shows the progression from pod to shiny green bean. At this point, I usually cook them a little longer to fully soften the bean. I put them in a skillet with a little water, less than ¼ inch, and let them simmer until the water evaporates and the beans are fully tender but still bright green. A little olive oil, chopped garlic, chopped rosemary and some salt and they are ready to enjoy as a side dish, pureed into a dip, or mixed with other vegetables. My friends Kevin and Mary add them to a salad of early potatoes, tarragon and feta. Most delicious! 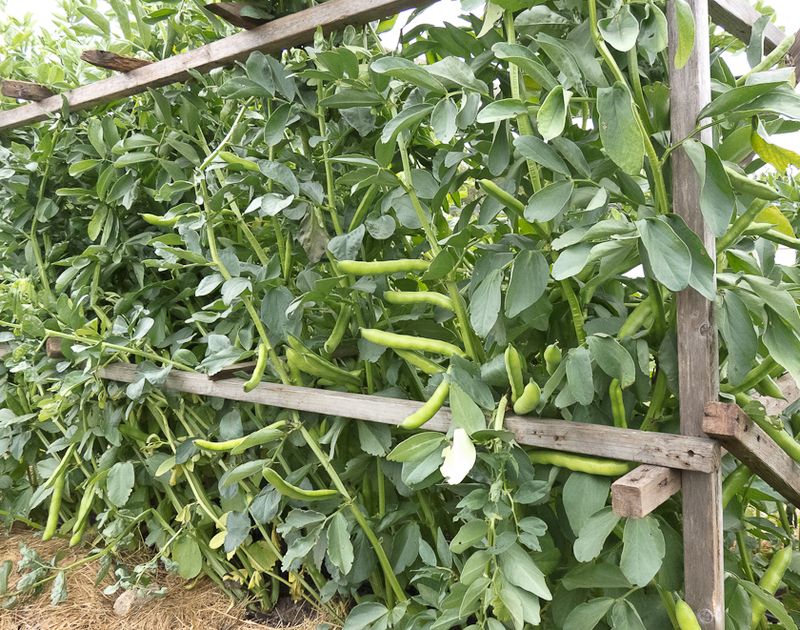 Favas also pair wonderfully with other vegetables that ripen about the same time: asparagus, artichokes, peas, spring onions are great complimentary flavors. I grow a lot of fava beans—usually four ten-foot rows. That means that at a certain point there are a lot of ripe fava beans. I set aside a morning and pick all that are ripe, shell, blanch, chill, slip out beans and pack them in pint freezer bags. 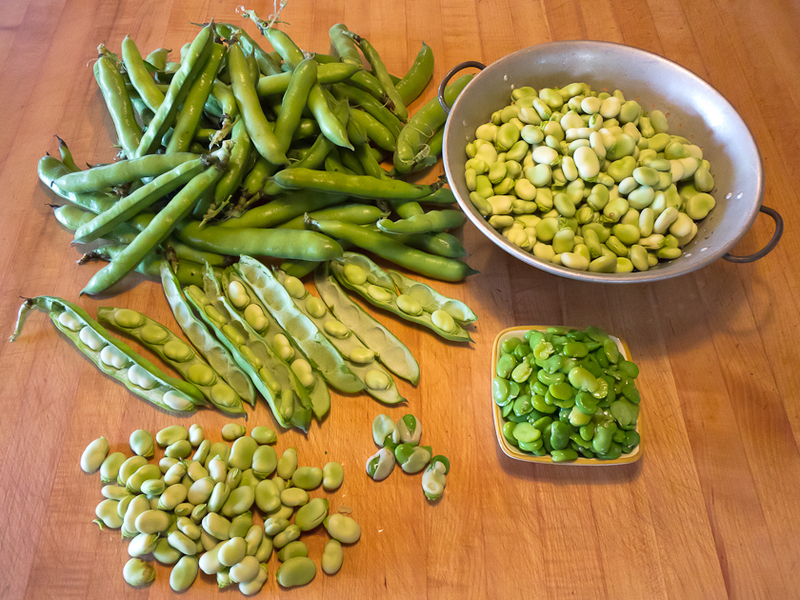 This year, fifty pounds of favas in the pod ended up as sixteen ten-ounce packets for the freezer. Not a huge return but still a special treat to enjoy throughout the winter as puree, in soups or mixed with roasted roots or hearty greens. I’ll write more about growing fava beans when I plant next year’s crop in late September. The variety I plant most years is Broad Windsor if you want to get some seeds and be ready to plant this fall. Finally, seed catalogs and cookbooks often mention that a very small percentage of people of Mediterranean, Asian or African descent may have an allergic reaction to fava beans, so pay attention to any allergic symptoms the first time you eat favas or serve them to friends.